We view parents as essential partners in our work, and the ECC is extremely fortunate to have a close-knit community of active and involved parents. Parents are welcome in the classroom for special activities, and are often asked to join classes for holiday and Shabbat celebrations. The Parents Association meets six times a year and organizes classroom activities and events outside the school, including our annual auction and book fair. When parents dedicate time and energy here, they send their children an important message about the value of school and the significance of our community in their family life. Our caring clergy play a huge role in shaping children’s early Jewish identities, and in bringing Jewish values and traditions to the classroom. 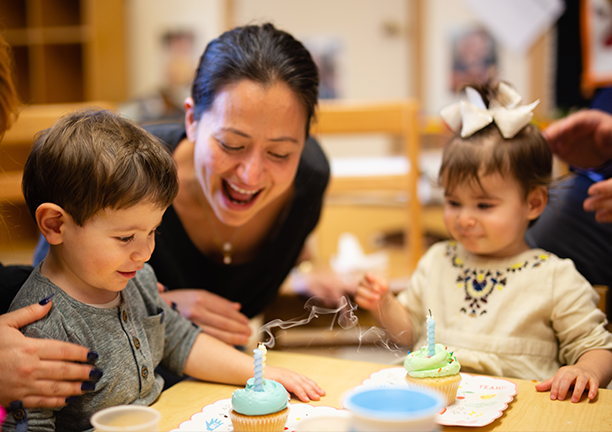 As part of the larger Stephen Wise Free Synagogue community, your family will have access to our rabbis, a vibrant religious school, joyous holiday and Shabbat services, and warm, welcoming family experiences specifically for those with small children. Administrators, clergy, and teachers are always available to meet privately with families and discuss any educational, emotional, religious, or financial concerns, among others. This committee serves as a policy-making body for the ECC as well as an advisory committee of the synagogue. It is comprised of one or more members of the synagogue’s board of directors, a Parents Association chair representative, an Auction chair representative, a Jewish Early Childhood Collaborative representative, a teacher representative, and ECC parents who have expertise in various fields such as budgeting, human resources, or education. The committee meets monthly and addresses issues relating to school policies, the preparation of the ECC’s budget, and the allocation of funds raised through ECC events, as well as many synagogue-related issues. Committee members are appointed by the synagogue’s board of directors. The Parents Association (PA) is a committee run by parents of ECC children that serves as the umbrella organization for all of the events and fundraising activities that occur at the ECC throughout the year. The PA also serves as a vital link between the parent community and ECC. The director and/or assistant director attends all PA meetings, where updates concerning important school-related issues are discussed. Each ECC classroom is represented by class parents, who foster communication between the parents in their classrooms and the PA. PA meetings are held approximately every month; all parents are welcome.